This edition, published in association with the British Library, has an introduction by Martin Edwards. 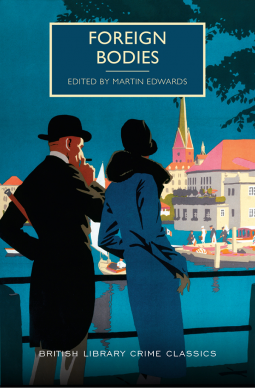 There are fifteen stories in this collection of vintage crime fiction in translation, written by authors from Hungary, Japan, Denmark, India, Germany, Mexico, Belgium, the Netherlands, Russia and France. Some are detective stories in the same tradition of Conan Doyle’s Sherlock Holmes stories, or in the same style as Agatha Christie; there are ‘locked room’ mysteries and stories mixing mystery and horror. Martin Edwards has prefaced each one with a brief biographical note, which I found useful as, unsurprisingly, the authors were all new to me, with the exception of Anton Chekhov (although I haven’t read any of his works). Edwards presents the stories in approximately the chronological order of their publication from 1883 to 1960 and notes that these authors were writing in the same styles at much the same time as Agatha Christie and other Golden Age crime fiction writers. When I began reading I was disappointed as I didn’t enjoy the first few stories. Short story collections are often a mixed bag and some stories are better than others, so after putting the book aside for a while I carried on reading. Some are very short and are predictable and really easy to see where they will end, but others are much more satisfying. The Spider (1930) by Koga Saburo who founded the Mystery Writers of Japan in 1947. His work was very popular in Japan and he wrote in the traditionalist style, favouring the puzzle element of a mystery. Edwards writes that it ‘is a pleasing fusion of macabre fiction and the classic detective puzzle‘, which explains why I like it. It’s set in a bizarre laboratory in a nine metre high round tower in which a professor is carrying out research on spiders. One night another professor visited him and fell to his death from the tower having been bitten by a poisonous spider. The circumstances of his death, however are not at all straightforward and are most ingenious. Probably my favourite story. Murder a la Carte (1931) by Jean-Toussaint Samat, born in the Camargue, a journalist and writer of crime and adventure novels. This story is about a case of poisoning, but poisoning with a difference. A guest at a dinner party explains how to get away with murder – by using a non-poisonous substance. It’s one of the shorter stories that I did find satisfying. The Venom of the Tarantula (1933) by Sharadindu Bandyopadhya from Bengal, educated in Calcutta, whose crime writing is similar to that of Arthur Conan Doyle. A writer called Ajit and detective Byomkesh Bakshi join forces to investigate what is an apparently ‘impossible crime’ featuring an ingenious poisoning. Nandadulalbabu is a hypochondriac who is writing fiction using black and red ink. He is addicted to venomous ‘spider juice’, extracted from tarantulas. His family have prevented him from getting the juice but somehow he is able to trick them and is still getting his fix. Although I was able to work out the solution it’s still a satisfying and interesting story. The Mystery of the Green Room (1936) by Pierre Véry from France. This story is dedicated to the memory of Gaston Leroux, and plays on the events in his story, The Mystery of the Yellow Room (1907), which I haven’t read, another ‘locked room’ whodunnit. I enjoyed this one , particularly where the private investigator points out to the detective the similarities between the yellow room mystery to this one, the green room mystery – this is an ‘open-room’ mystery as opposed to a ‘locked-room’ puzzle. Kippers, delectable, salmony kippers, smoky as a chimney, dripping with fat, one for each of us, of course, the real thing. Even Bertie the cabin boy got one. A sinister tale about a shipwrecked crew on a desert island that ends in horror. I’ve just given up on yet another book from this series. I think I have to admit that despite my love for Allingham, I am just not a Classic Crime reader. Some are better than others – some are just boring, or very strange (some of Michael Innes’s books for example). This one is a mixture of interesting and tedious. I’m glad to hear you enjoyed some of the stories, Margaret, even if not all of them were appealing to you. And I do like Martin Edwards’ Introductions; he’s very knowledgeable, isn’t he? His introductions are excellent – without them the book wouldn’t be as good.